Imagine this. You're a low level clerk in a mammoth bureaucracy. You like your job. You don't think much about what you are actually doing. Then one day...somebody you respect says that what you are doing is bad for the country. You're embarrassed, defensive bewildered. You start thinking about who's being helped and who's being hurt by what you do. And once that happens, you might just end up like Luana Barnes, the heroine of the play, launching a one-woman revolution that for a few moments brings the mammoth bureaucracy to a crashing halt. One set. Four characters. Two men. Two women. 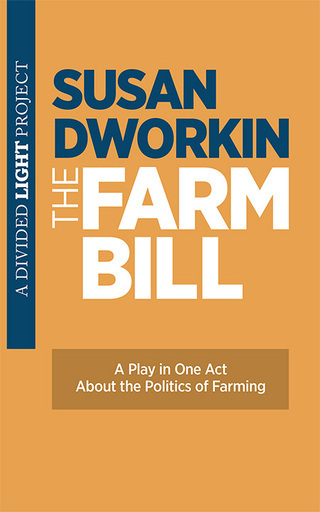 THE FARM BILL is an easy-to-produce 35-minute play that will ignite discussion. Perfect for theatres, schools and as the program for a truly memorable meeting. SPECIAL OFFER FOR SCHOOLS AND ORGANIZATIONS! - Five copies of the play, plus a production guide. - Package includes a one-time royalty fee that allows a school or a community group to use the play on a no-admission-cost basis as often as desired. Discussion questions are bound in with the script. 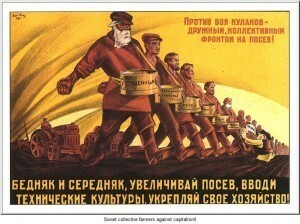 - The price for the package is: $75.00. 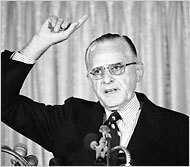 Earl Butz, Secretary of Agriculture, under Presidents Richard Nixon and Gerald Ford.